After Hurricane Sandy destroyed the Rockaway boardwalk, Claire Weisz of architecture firm WXY imagined a new public space for New York City. At Dwell on Design New York, she'll share her tips for creating work in the public realm. After Hurricane Sandy, architecture firm WXY was commissioned by NYC Parks and NYCEDC to rebuild the boardwalk and create a plan to improve existing parks across the Rockaway peninsula. 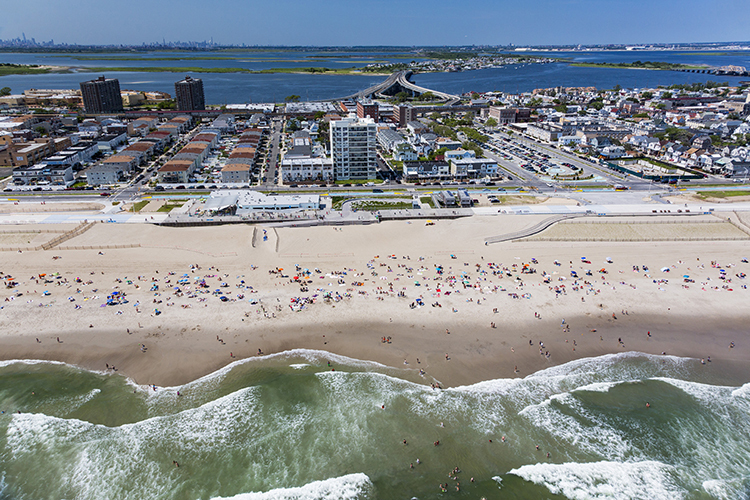 Architect Claire Weisz designed the boardwalk to clarify and improve its circulation. Cast concrete planks recall the iconic beachfronts of destinations like Rio de Janiero. Their shape mimics waves crashing on the shoreline, while an aggregate embedded in the blue sections glows at night, spelling out ROCKAWAY in giant letters along the length of the boardwalk. The new project needed to be able to stand up to storms—the reinforced-concrete boardwalk is elevated above the 100-year floodplain—but Weisz referenced the original boardwalk through material choices, like the slatted wood used on these benches. The entire boardwalk project is dotted with shaded spaces for people to pause or gather. While these types of civic projects involve many agencies and layers of bureaucracy, ultimately, Weisz says, the most important client is the public. The first phases of the Rockaway boardwalk opened this past summer; it is expected to be completed for the 2017 season. Dwell on Design New York takes place at Skylight Clarkson Sq from Oct. 2-4, and features three days of stimulating discussions with industry leaders. Claire Weisz of New York's WXY will join Rinat Aruh and Johan Liden of branding and product-design firm Aruliden for the panel discussion "Working for the Man: How to Win a Government Contract, and What to Do Once You've Got One," on Saturday, October 3, at 12:30 p.m.